The UK’s true fleet sector has recorded another negative month in 2019 despite March traditionally being the strongest month of the year due to the plate change. Figures from Dataforce show true fleet saw the largest contraction of all the channels with a 9.3% fall while the private and dealer/manufacturer segments posted negative growths of 2.8% and 2.9%. The short-term rental sector however was up 13.6%, helping the total market to finish with 458,054 registrations, down by 3.4%. Dataforce added its view that until Brexit has finally concluded – either way – the negative growth will likely continue along with the current nervous buying sentiment. Looking at the top 10 performers in true fleet, there were seven OEMs with changes to their ranking, some good, some bad. VW re-took the number one spot for the first time in 2019, gaining a place from March 2018 results despite a 1.0% decline. Mercedes and BMW followed, both with strong performances of +7.2% and +13.2% respectively – BMW had ranked first in true fleet for February. Ford was next in line with Audi and Nissan trailing. However, Vauxhall/Opel Vauxhall dropped six places into seventh and with the highest decrease of 55.2%. On the plus side, the Grandland X tripled its registrations (+221.1%). 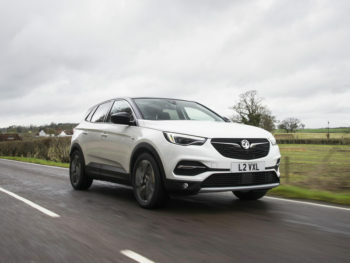 Toyota and Kia were the next two on the ladder, while SEAT entered the top 10 with a solid growth of 9.5% thanks mostly to the Arona and Ateca. Within the fuel type league chart, neither petrol nor diesel saw positive results but both Hybrid (+6.7%) and Electric (+98.9%) were up. Top 3 from the electric camp were the Nissan Leaf, BMW i3 and the Jaguar I‑Pace. For Hybrids, Toyota was top of the list with the C-HR finishing in front of the Mitsubishi Outlander and Toyota Yaris. Diesel posted a double-digit deduction of 21.9% but Dataforce said the arrival of RDE2-compliant models may help to put the brakes on the diesel decline as they escape the 4% Benefit in Kind surcharge.